Today brings another new beer style to my bar. This is a uniquely French beer style, and is known as a 'beer for keeping', as such I've had this bottle for close to 6 months and have finally got round to drinking it. Apparently it's excellent, however I feel it will be difficult for it to top yesterday's beer. A quick google showed me that the brewery that makes this beer, also produces a beer called Trois Monts which I have had the privilege of having. It's a fantastic beer, which has a staple to hold the cork in as the carbonation is so strong. Once you remove the staple the cork flies literally across the room so be carefull if purchasing. This has given me much higher expectations of this beer, even though the French aren't known for their beers. This beer pours a magnificent reddish-brown colour with a monstrous quite thick head. Lots of bubbles are rising to meet the head, which has a slight orange tint to it. The bottle claims it to be a red ale and so I would have liked more colour, until I held this beer to the light, it almost glows red it's quite amazing. Anyone who has had the James Squire Highwayman will understand this is a big call when I say it's almost that red. 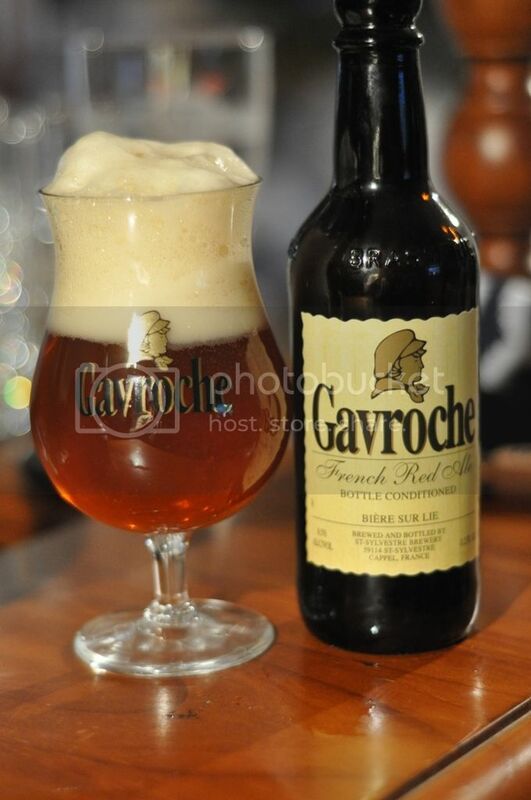 Gavroche is an extremely good looking beer, albeit hard to pour because of the huge carbonation. On the nose I get some distinct flavour groupings, firstly fruit followed by honey, caramel malts, some light hopping and some excellent smelling Belgian yeasts. There are also hints of spices much like a Christmas beer. The yeasts are of particular interest too me as I believe them to be the same that are used in Pauwel Kwak, one of my favourite beers. The smell is slightly sweet and after the fruity smell the honey really takes over, it smells very warming. The fruit flavour becomes very apparent the second one tastes the beer, it's cherries. They are slightly sour and it helps balance the beer, which on the whole the beer is slightly sweet. The honey flavour is overly sweet, and the caramel malts although not particularly pronounced add to this. There are some hops but they are of an earthy quite bland variety with little bite. There is a spicy bitterness which pulls this beer together well in the end, without overpowering the flavours. It's quite nice, if a tad sweet for my liking.